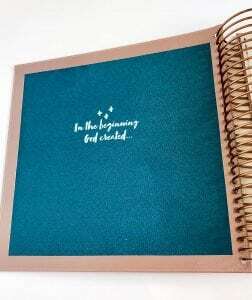 Read our Illustrating Bible review of the spiral bound journaling bible by Illustrated Faith. 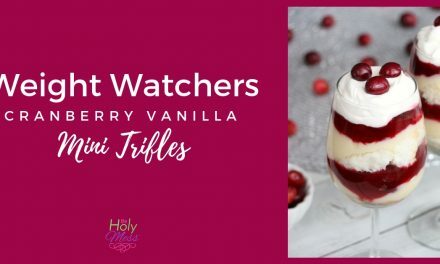 What happens when my favorite Bible journaling gurus get together and design a Bible? Answer: the little peace of heaven on earth called the “Illustrating Bible”. 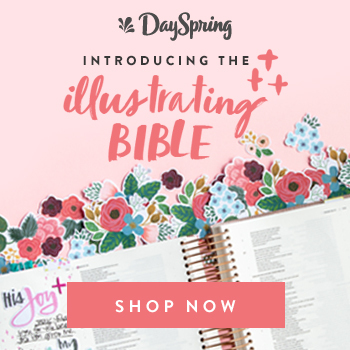 The new Bible by Dayspring and Illustrated Faith is a Bible journaler’s dream with thicker pages, a spiral binding, a square layout, wider margins, and much more. 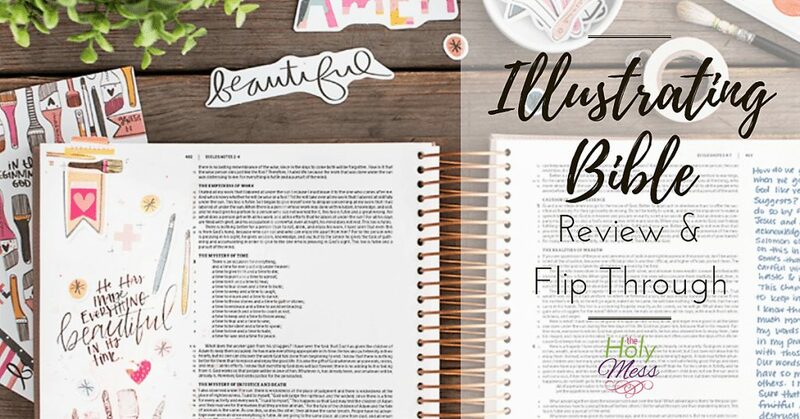 Read on for a full Illustrating Bible review. Largest margin: almost 6 inches! Margins as large as 6 inches! Here is our video flip through and review of this beautiful new Bible. I must admit that I was not in the market for a new Bible when I heard of the Illustrating Bible release. I have three journaling Bibles each unique in design and translation that I use for different purposes and moods, but the thought of a Bible designed specifically for Bible journalers intrigued me. 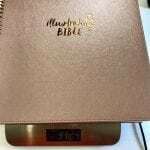 The more I researched the features (and I do mean research as this Bible was very hush, hush almost until release) I realized that this Bible addresses so many frustrations that I have with my current journaling Bibles. Finally there is a Bible that I can stop worrying about “messing up” and just celebrate art journling. Why is The Illustrating Bible Square? 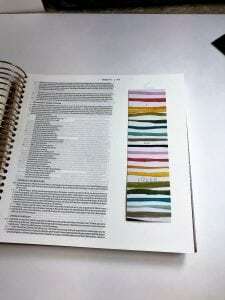 The Illustrating Bible is square to make taking and posting photos of your favorite pages easier. 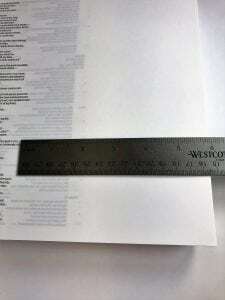 How thick are the pages? Does it really prevent bleed-through? The pages are 75% thicker than average Bible pages. I think they feel a lot like regular book pages. Ghosting (when you can see the image from the other side) will happen, but bleed through will be less common. 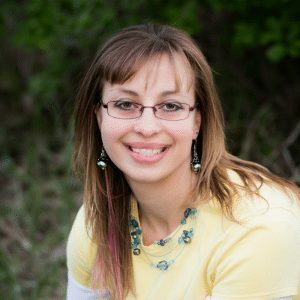 Why is the Illustrating Bible Spiral Bound? The spiral binding is a double bonus — the Bible will now lay flat while you create and you no longer have to worry about broken bindings! Win and win! What translation is the Illustrating Bible? Why? The Illustrating Bible is in the Christian Standard Bible translation. This translation has the benefit of both readability and accuracy. Is the Illustrating Bible too heavy to be practical? Weighing in at almost 5 pounds the Illustrating Bible is one heavy book. It is designed for creating, but that doesn’t mean that it has to stay stuck at home. 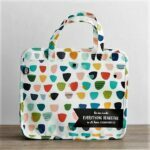 These organization totes from Illustrating Faith are the perfect size for taking the Illustrating Bible along with you. 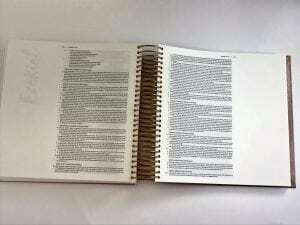 I love the Spiral Binding of the Illustrating Bible, but will the pages rip? I was slightly concerned that the spiral binding would equal less stable pages, but after spending some time with the Illustrating Bible I am comforted in their durability. Plan to be as careful with this Bible as any other journaling Bible and you will be enjoying it for a long time to come. The wide margins of the Illustrating Bible are great, but I’m intimidated by all that blank space! How can I get started? I always recommend starting with your favorite verse. Holiday stickers and the Illustrated Faith Print & Pray Shop are great ways to break the ice. What color are the pages? The Illustrating Bible sports white pages that I love! Now my white sticker paper blends right in. The Illustrating Bible is crazy expensive. Is it really worth the cost? Will it go on sale? I am so excited to start working in my new Illustrating Bible. 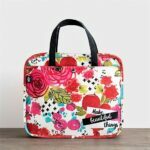 Its well-designed features are ready to solve many of my Bible journaling frustrations. No more balancing sticky notes under one side to get it kinda flat and keeping it closed with a rubber band. No more gesso and paint running into the spine. To me it was worth the cost to upgrade. If you feel the same remember that Christmas is less than 100 days away. We love sales, coupons and saving you money. Dayspring has not advertised any upcoming sales, but we won’t leave you in the dark if we hear anything. 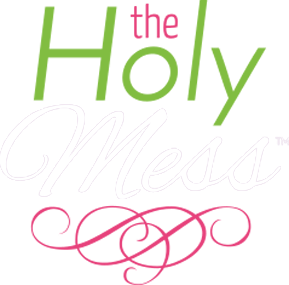 Join us at The Holy Mess Bible Journaling Facebook group so you don’t miss out. 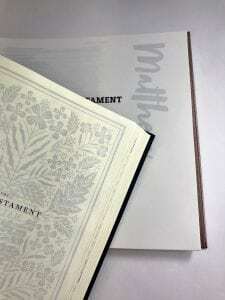 Do you plan to invest in the Illustrating Bible? Share what you love about it in the comments. Even better, come to The Holy Mess Bible Journaling group and share a photo of your Bible journaling artwork. Are you curious about how we got the Bible and history of Bible translations? Check out this interesting information.